The odd thing wasn't that men and women were walking around naked, some smoking marijuana at noon in Diamond Head Crater. And given Hawaii's usual tolerance, it was not odd that only a handful were arrested. 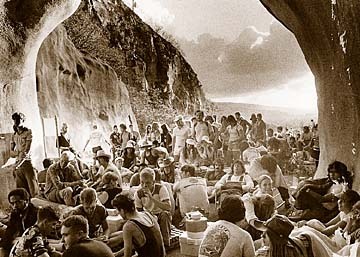 What was odd, however, was that the Diamond Head Crater festivals went on for so many years before state officials and complaining neighbors finally halted the all-day music celebrations. "It was a gathering of people, it wasn't just music -- it was everything. We had arts and crafts, we had folk, rock and Hawaiian music," said Tom Moffatt, local music promoter, who helped organize the first crater festival on New Year's Day 1969. "It would be a steady stream of people. The crowds were enormous. It was an all-day happening. And the problems were minimal." The festivals were a sign of the 1960s' live-and-let-live times. Like others nationwide, Hawaii's people were grooving and experimenting with everything from drugs, to rock 'n' roll, to activist causes. Sunday Manoa is among the entertainers in 1973. "From their make-shift booths, youngsters sold cookies with zodiac and peace symbols on them, avocado sandwiches and apple juice. "The crafts on display ranged from bamboo flutes, hippie clothing and artwork to water pipes, roach clips used to hold 'joints' and other items of the young drug culture." The crater festivals, first produced to promote a new radio station, KPOI-FM, were held with minimal legal problems. The Hawaii National Guard ran the crater and had no objections. There was no entrance fee, craft makers were free to set up shop, no cars were allowed in the crater, and all the food sold had to be vegetarian. Moffatt, an island entertainment promoter for more than 35 years, said the crater festivals were the high point. Eventually, however, the festivals fell out of favor with the state's bureaucrats. They also became more commercial as several were held a year, not just on New Year's. By 1979, a state-appointed citizen's task force asked the state Department of Land and Natural Resources to ban the festivals. During that time and after, however, Hawaii was the scene for most of the big rock and entertainment acts in the country. "We had a lot of music come in -- the performers with the lyrics that were influencing the generations: Grateful Dead, Byrds, the Rolling Stones came three times, just about everybody -- except the Beatles," Moffatt said. In the early 1970s, music in the Hawaiian language started to make a serious return. Gabby Pahinui, Peter Moon and the Sunday Manoa were forerunners of the new style. By the mid-1970s, much of local music was reflecting growing disenchantment with government and official entities. The music renaissance fed - and fed off - a new generation of young people who were discovering their Hawaiianness and pride. 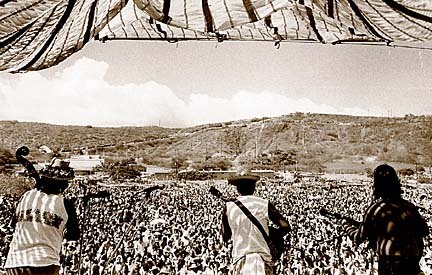 The songs became an active proponent for Hawaiian sovereignty issues. "(Protect Kahoolawe Ohana activist) George Helm was one of the first artists to combine nationalism and music," said John Berger, Star-Bulletin music critic. "I don't know how well he would have survived in today's musical climate. That sort of passion today is unfashionable." The Honolulu Star-Bulletin is counting down to year 2000 with this special series. Each installment will chronicle important eras in Hawaii's history, featuring a timeline of that particular period. Next installment: November 8.